Cross over the old Louisville & Nashville Railroad in this town remembered for its Civil War encampment and you'll see the first signs—there's fresh anticipation in the rural areas that will be prime viewing locations for the first coast-to-coast total solar eclipse to sweep the United States in 99 years. "We've talked about this a lot. It's exciting to have all these people coming together," said Julie-Anna Carlisle, owner of a wellness boutique in downtown Hopkinsville. "We live across town, but we've decided to camp out in the shop. I don't want to be caught in a traffic jam and not be able to open the store." Tens of thousands of people—estimates reach 100,000 people from as far as Japan and South Africa—will watch the eclipse from the area, and that has communities small and large bracing for an influx that could put a strain on resources and infrastructure. 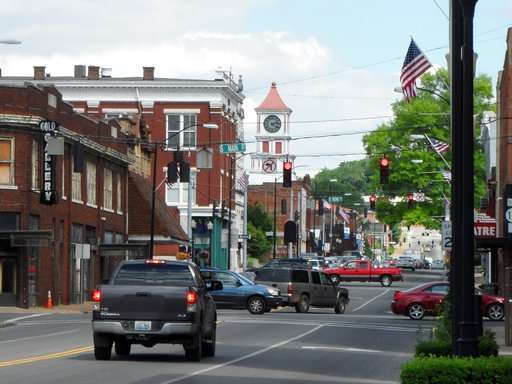 Hopkinsville, a city of about 32,000 people and the birthplace of the "sleeping prophet" Edgar Cayce, is nearest the point of greatest eclipse—as the axis of the moon's shadow cone passes closest to Earth's center. Hopkinsville is in the area that will be getting the longest total eclipse—at 1:24 p.m. CDT Aug. 21, the moon will pass in front of the sun and cast darkness on the rolling farmland, plunging it into darkness for about 2 minutes and 40 seconds. "Everybody is talking about the eclipse because they see it as such a wonderful opportunity. It provides a unique, scientific experience for eclipse chasers from all over the world," Hopkinsville mayor Carter Hendricks said. "They're excited that Hopkinsville is on the international map. They're excited to play host to visitors from all over the world." Hendricks said the city learned of its place in the path of totality—total darkness, as day briefly becomes night—about 10 years ago and has spent more than half a million dollars on preparations. His biggest concern isn't just the weather—cloud cover or rain the afternoon of the eclipse—but people not showing up. "The good news for us is the science is on our side that it will be a sunny, hot day," Hendricks said. "If it's cloudy, then we'll just have to deal with that reality as best we can and help people get to other locations. But, if somehow we overprepare and we're underwhelmed by the crowd size, that's a big concern for me." Preparations outside Hopkinsville extend well into rural Christian County. The city has asked Gov. Matt Bevin to station National Guard troops on some of the county's two-lane roads to help control traffic. The state gave the Hopkinsville-Christian County Airport a $300,000 grant for upgrades. Public safety officials are coordinating with fire departments, law enforcement officials, and doctors and hospitals to handle emergencies. More than 20 local events are planned, including a three-day music festival, a bourbon tasting, and a festival commemorating the Kelly-Hopkinsville encounter—the reported landing of "little green men" in nearby Kelly on Aug. 21, 1955. Hopkinsville plans to turn off its street lights near its designated viewing areas so visitors can get the most out of the eclipse experience. Brooke Jung, city eclipse coordinator, says watchers will be able to see the moon's shadow stretch across the land. "It'll look like twilight outside. You'll be able to see stars. Four planets will be visible—Venus, Jupiter, Mars and Mercury. You'll notice the temperature drop about 5 to 10 degrees," Jung said. "You'll notice that animals will get a little disoriented. Birds will think that it's nighttime and go in to roost. Some of the flowers and plants that close up at night will close up." This year, total darkness will fall over 14 states from the Pacific Northwest to the South Carolina Lowcountry. NASA says 391 million people in the U.S. will be able to see at least part of it.